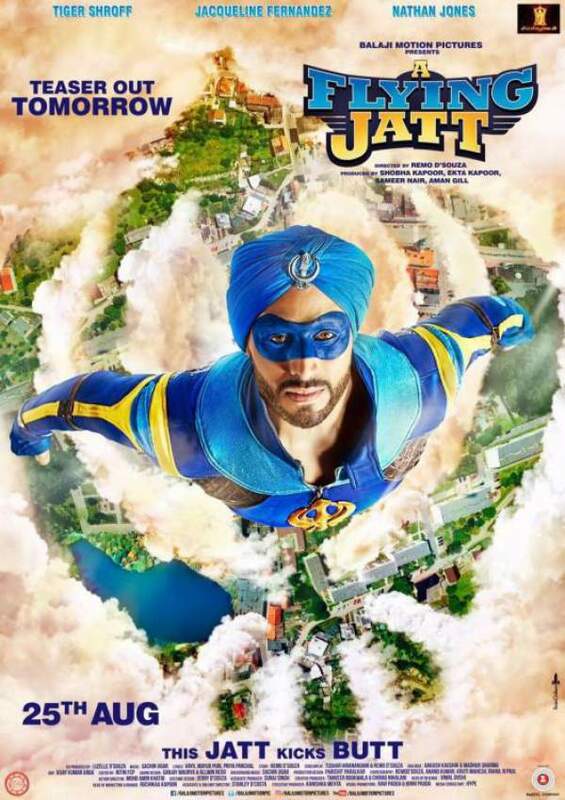 Home Entertainment A Flying Jatt Official Trailer: Movie Theatrical Trailer Video is Out! A Flying Jatt Official Trailer: Movie Theatrical Trailer Video is Out! Tiger Shroff’s character in AFJ is a mixture of Superman, Batman, and Ironman all at once. However, he appears to be more of a comic rather than a world saver as apparent in the trailer video itself. The teaser shows us Tiger gets his cape entangled in a car, being chased by dogs, and police officers asking him about his heck costume. Amrita Singh plays the role of his mother who bullies him to dust the house. During his free time, he appears to woo Jacqueline Fernandez. He saves the world too, but it looks like he is an injury-prone superhero. When he tries to save kids stuck in a burning house, he gets his finger burnt. Then, arrives the villain. Kay Kay Menon plays the role of the antagonist in the film who sends his villain who appears as Rajinikanth in Robot. The supervillain is played by wrestler-actor Nathan Jones. He was last seen in Mad Max Fury Road playing the character Rictus Erectus. The fight between the superhero and supervillain is like a battle between Superman and General Zod. At first, Jones defeats Shroff. Then, Tiger goes back and trains himself to the best possible extent. After that, he returns and fights back and defeat the villain. The audience used to marvel and dc level of entertainment, they will be disappointed by the level of special effects used in the flick. At some points, it goes like a comedy talkie and brings some laughs. The film basically depicts that good wins over evil whatever the condition may be. Sometimes, it also appears as if the movie is inspired from the Hrithik Roshan’s Krrish. Have you watched the A Flying Jatt official trailer? Did you like it? What are your views and thoughts? Feel free to share via commenting below and check what others have shared below. Don’t forget to share it on social media sites like Facebook, Twitter, Google Plus, etc. Stay tuned to The Reporter Times for latest entertainment news and Bollywood updates.